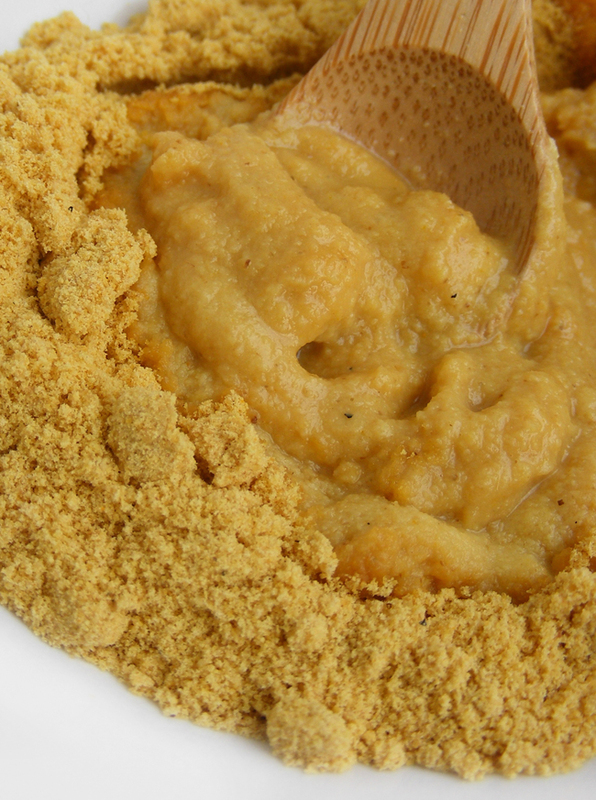 Japanese mustard, Japanese mustard powder, hot mustard, wa-garashi / 和からし (mustard), kona-karashi / 粉からし (mustard powder), neri-garashi / ねりからし (mustard powder paste). Kona karashi simply is the Japanese version of mustard, only normally it’s not a readymade sauce or paste like we´re used to in the West, it’s a powder that you have to mix yourself with a little water. This means the mustard will taste hotter, much more pungent, but also a little bit more bitter and less sour because no vinegar is added like in Western mustards. It is made of the same, ground mustard seeds though, so it isn’t hugely different. Nowadays you can also buy it in tubes, but why would you? Just mix some powder with a little water (ratio 1:1) to form a paste. Preferably shortly before you want to eat it as it will lose flavor quickly once exposed to the air. If you want to keep it, then cover it with some cling film. Serve it on the side with your steak, schnitzel cq tonkatsu, oden, miso-soup or natto. Or mix it with some soy sauce, ketchup or mayonnaise to form a sauce. Use it to dry rub a pork chop, whatever you like. Japanese mustard powder keeps almost for ever. You can add a little turmeric powder to lift the color into a brighter yellow. Kona Karashi is actually quite comparible to Colmans’s English Mustard Powder. So you could substitute one with the other.